Ryan Hall's Coach Terrence Mahon Sits Down With LetsRun.com: "I would not be surprised if he won the race on Sunday"
But first up we sat down and talked to Ryan Hall's coach Terrence Mahon about Ryan's meteoric rise in the marathon and his chances on Sunday. (The entire 17 minute video is at the bottom of this article and to the left here). First off, lets get the cat out of the bag. Terrence had this to say on Ryan, "I would not be surprised if he won the race on Sunday." Mahon's statement shows just how far Ryan has come in the last year and a half. A tremendous talent in high school (3:42 for 1500), Ryan had an up and down collegiate career, but really went out with a bang in 2005, making the US World Championship team at 5000m. 2006 however was a disaster on the track. Ryan was 8th at the US Nationals for 5k and then went to Europe and did not get much better. He ended his European campaign with a last place 13:58.69 finish at the Norwich Union Grand Prix on July 28th in Britain. 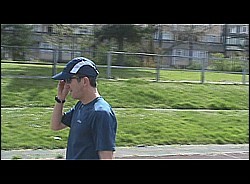 Ryan then retreated to what he does best, long distance training. The plan was to just to get back to the bread and butter of training. Terrence said that Ryan has a very small window of opportunity when he trains hard on the track, but that he is just made for long distance training. The training went well and then the plan shifted for Ryan to salvage the year at the US 20k champs on Labor Day in New Haven, Ct. The result? A 59:29 win. The season was then extended to the World Road Running Champs in Hungary where Ryan got even better, running a negative split 57:54 American record to finish in 11th place. It was after Hungary, that Terrence said he and Ryan first began to consider the marathon. Mahon said, "Then we started talking about the marathon... So I said let's use the US half as a spring board and do a two and a half month block of marathon training (and see how it goes at the US Half Marathon Champs in Houston)"
Attention switched to the 2007 Flora London Marathon where Ryan ended up going out with the second pack, catching the lead pack, taking the lead, and then getting dropped over the final 1.5 miles and finishing 7th in 2:08:24. As impressive as Ryan's run in the heat in London was, Terrence said the goal for Ryan was to run 2:07 last year in his debut: "We're pretty bold with our training. With the work we have done, we have the training down pretty well, so we're not afraid to throw down big times to see if it is valid (the training)." Mahon gave his assessment of Ryan's race last year in London, "We thought he did a pretty good job. He kind of fell apart the last two miles but I think that was mental errors more than physical... I think he had the 2:07 in him". The next big event for Ryan was the US Olympic Marathon Trials in NY. The result? Another incredible and improved performance- a dominating 2:09:02 win with a sub 1:03 second half marathon that left the NYC crowd in awe. Many speculated whether the performance on the hilly Central Park course would have been good enough to win the ING NYC Marathon the next day. Mahon said, "If you break 2:10 on this course that will be a phenomenal run (was what we determined before the race).... To break 2:09... easing up the last part, jogging the first 10k, he could have run 2:08 on that course. He keeps pushing the bar (higher)." Mahon indicated that the one constant so far for Ryan has been that he has always exceeded expectations in the longer races. "Ryan, especially on the long stuff, continues to surpass my/his top end goals that are out there," Mahon said. And that brings us to London 2008. It will be hard for Ryan to exceed Mahon's expectations this time as they are pretty high. "I would not be surprised if he won the race on Sunday". There has been no attempt by anyone in Ryan's camp this week to downplay his fitness or chances on Sunday. Mahon however was realistic in assessing the extremely talented field Ryan will be facing. (London is the top marathon in the World outside of the Olympics.) Terrence said, "Looking at this field, he could easily finish in the same place as last year and run two minutes faster." Nonetheless, Terrence and Ryan both indicated that he has progressed to another level in his training on his tempo runs. (Since they are designing workouts focused on being able to sprint at the end of the London Marathon, clearly they are confident in Ryan's fitness and abilities. Ryan said his tempo runs are at another level and Mahon talked about Ryan doing 20 miles runs with the last 8 at sub 4:45 pace at altitude). Nonethless, Terrence and Ryan see London as a learning experience that only has an upside. "Ryan and I have definitely come into this race, the reason we said 'Hey let's do London', is because everything was going to be a success... It's all going to be a learning curve. If he goes out too fast and burns (and dies), for us we know where the top edge of the envelop is. If he is in the front and feels great and produces in the top three, then we know what is possible for Beijing... For us it is a matter of putting him in this stressful situations of 'hey now you're one of the contenders for one of the biggest marathoners in the world and how do you handle that stress.' "
The thought of a US developed athlete being able to contend for the win in London has many US distance fans excited, including "Coach" (as Ryan calls Terrence). Terrence said, "I think it's great for US distance running, that Ryan, (and Dathan) Ritz(enhein), they are sticking their necks out trying to run the best races in the world. I think we have to give them a learning curve and realize they are putting themselves on the world stage and sometimes setting themselves up for small failures along the way, but the only way to get this experience is to get the hard knocks by running in London." And that brings us back to Mahon's statement "I would not be surprised if he won the race on Sunday." Whether it happens or not, it definitely is a great moment for US distance running. As crazy as it may sound to US distance running fans, Terrene Mahon is not too worried about Ryan being able to handle a 1:02:30 half way pace. He had this to say, "We've heard 1:02:30 for a long time. We heard it a couple of months ago. So, it's actually pretty good for Ryan (to hear it and to have) to put himself in that type of shape because he wants to run in the front pack and that was kind of our goal to just give him front pack experience. We're not overly concerned what the speed is as we've seen enough marathons (where the pace isn't what it was said it was going to be, the weather changes, etc)... If you're looking at it from a physiological standpoint, we're still looking at 3 minutes off his half marathon (best) so he should be pretty comfortable from that standpoint....(Former World Record Holder in the marathon Khalid) Khannouchi has never run out (faster than 1:02:45)... but Khannouchi never ran under an hour for the half. Maybe having that comfort zone (of 59:43), (means) 1:02:30 doesn't seem that scary. Mahon also touched on the pressures of coaching America's two greatest marathoners (Hall and Deena Kastor). Mahon is married to American distance star, Jen Rhines, and basically he got his feet wet in coaching the untraditional way, by coaching America's best. He takes the responsibility seriously. He said, "I feel responsibility to ever athlete I coach.... Starting out with Jen and Deena and the level of success they were at when I started with them and where they were expected to go, I think that really (gave me) a quick learning curve..." He said the pressure was greatest for him for Deena's first two marathons but now he realizes, "This is the game we're looking to play, these are the fields we're looking to be with." One of the advantages of being so green as a coach is that Mahon is able to lean on others for advice (and confident enough to do so as well). He said, "I definitely started at the top (in terms of the athletes I coach) and I made sure on my speed dial list I have a lot of experts to talk to. I know starting where I am, I know I don't know a lot, and I think that helps me because it allows me to pick up the phone and call someone.... I (will) consult anybody and everybody. I think everyone has a lot of good information and it is about piecing it together. " Talking to Mahon this week, it's apparent the Villanova grad who studied English and philosophy is not just focused on the physiological aspects of training. He's also interested in the mental side and figuring out the type of environment each athlete needs to succeed. Mahon said, "I just see it as the world as a whole. Whether it's training, business, or whether it's life in general, watching how relationships occur and how people just react to different things in their lives those all important facts to understand what makes someone tick...I think the psychological component of athletes, the racing styles, the training styles, how they adapt to different types of stresses is hugely misunderstood. I think you can talk training theory all day and have sound training theories, but if you don't know how to part it to the individual it's a waste of time... It's like Monday morning quarterbacking, (they) say you have to train this way, but you have to know your athlete." Thankfully for letsrun.com, Monday morning quarterbacking is still allowed.